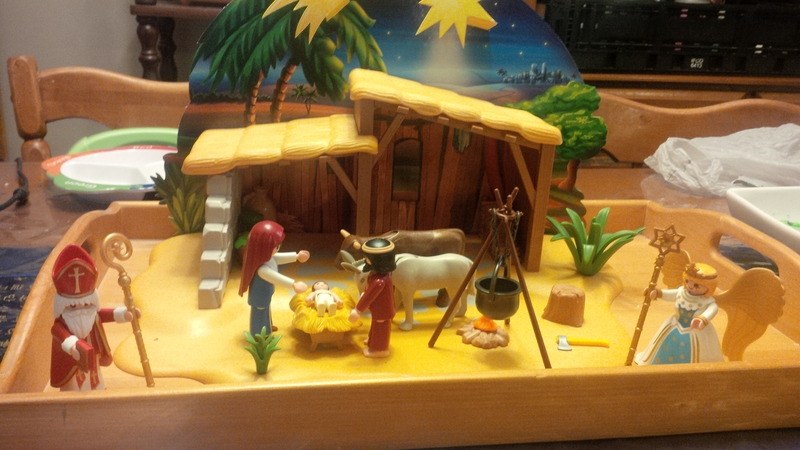 Today’s baby Jesus is from Playmobil kit #4884 and can be viewed/ordered here. The smallest package was the most exciting. The central piece of the scene arrived today. With baby Jesus in the scene, we now have a natural center. 2 The people walking in darkness have seen a great light; on those living in the land of deep darkness a light has dawned. 3 You have enlarged the nation and increased their joy; they rejoice before you as people rejoice at the harvest, as soldiers rejoice when dividing the plunder. 4 For as in the day of Midian’s defeat, you have shattered the yoke that burdens them, the bar across their shoulders, the rod of their oppressor. 5 Every warrior’s boot used in battle and every garment rolled in blood will be destined for burning, will be fuel for the fire. 6 For to us a child is born, to us a son is given, and the government will be on his shoulders. And he will be called Wonderful Counselor, Mighty God, Everlasting Father, Prince of Peace. 7 Of the increase of his government and peace there will be no end. He will reign on David’s throne and over his kingdom, establishing and upholding it with justice and righteousness from that time on and forever. The zeal of the Lord Almighty will accomplish this.